We occasionally get asked whether the HttpWatch automation library can be used with Python. The simple is yes – Python can be used just like any other programming language that supports COM on Windows. 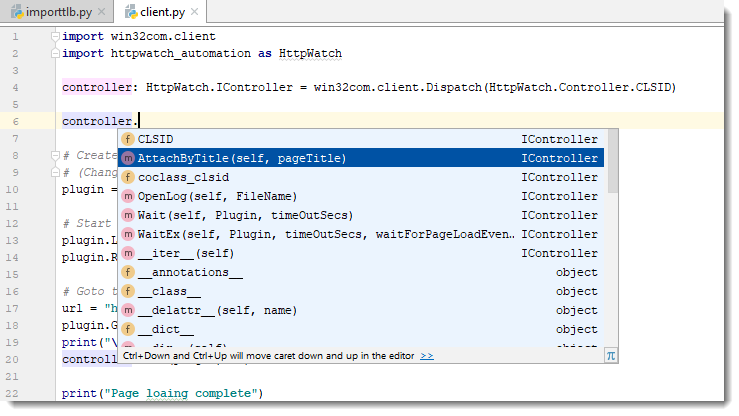 This blog post describes how to use the HttpWatch interface but the same approach can be used to access other COM components from Python. The following steps show you how to build a static typed Python client for any COM library with example code for the HttpWatch automation library. Python doesn’t have built-in in COM support so you’ll need to install the pywin32 module by manually running several commands. comTypeLibraryOrDLL = r"C:\Program Files (x86)\HttpWatch\httpwatchprox64.dll"
The second import uses the base name of the Python binding file generated in step# 3 and wraps the types in the specified namespace (i.e. HttpWatch in this case). The binding file will be located automatically if it exists in the same directory as your Python code. Python variables are dynamically typed by default. This means that they take on the type of whatever is assigned into them. You can change to using static typing by specifying the type after the variable declaration. In the code below we used HttpWatch.IController as that’s the interface type for the initial Controller COM class used by HttpWatch. You don’t even need to specify the types for other variables that are used to hold values derived from the initial interface. The IDE can deduce their type by looking at the information in the Python binding file. 6. Write the rest of your code!